We're leaving Koh Lanta with a better sense of what we like about living in Thailand. Which is ironic, because we are on our way out of the country! More of that straight, boring ride as we prepare to leave Thailand. We have an overnight stay in Hat Yai, just north of the Malaysian border. Our hotel reminds us of the Love Hotels in Latin America! We're a little concerned about passing through Southern Thailand. Over the last decade, Hat Yai has been in the news due to a series of terrorist attacks. There's a separatist group which is fighting for independence from Thailand on behalf of the Muslim population near the Malaysian border. There have been several bombings, the last one as recently as 2014. Despite this history, we ventured into town to try to find some dinner. It's like any other Thai town, we didn't perceive it to be any more or less dangerous. 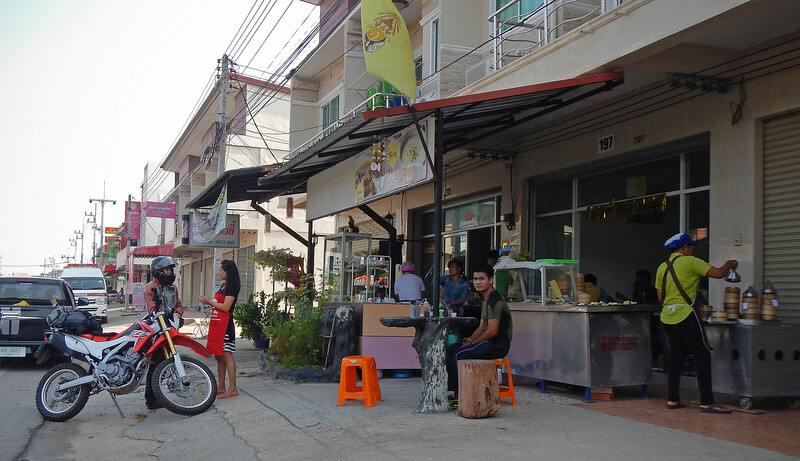 As we were leaving Hat Yai early in the morning, we decided to stop at a food stall which was open for breakfast. We couldn't read Thai, so we just asked for whatever everyone else was having. The lady who ran the place served us a bowl of hot congee, which is a rice porridge. Except she didn't call it congee, she called it jook - which is the Cantonese word for congee. Growing up in Malaysia, this is what we know it by. I had never heard of the word congee until I came to Canada. Apart from all the mosques we had seen in the area, this was the most personal reminder to me that we were headed to the place where I used to live. So excited! It's a short ride to the Malaysian border from Hat Yai. 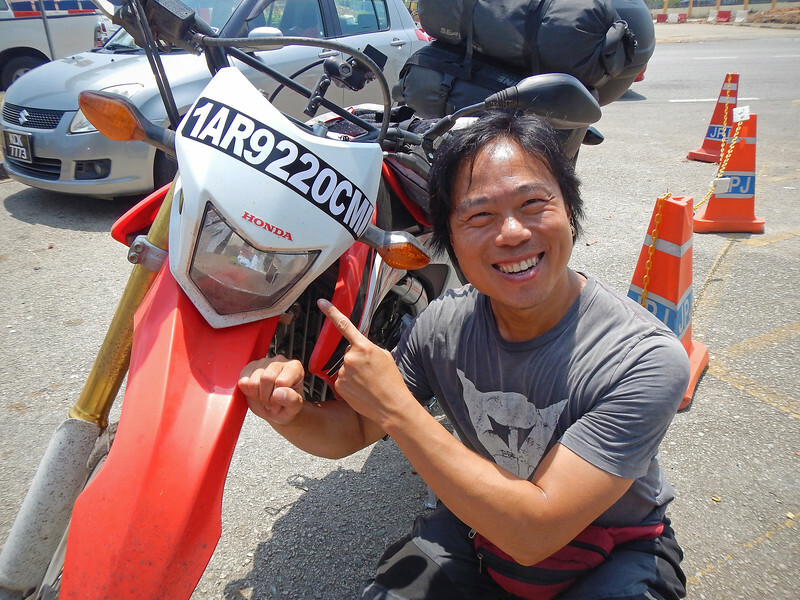 As we were leaving Thailand, we got our passports stamped quickly and then we were looking for a place to export out our bikes. Couldn't find anywhere to do it. We talked to a guard standing around and he just waved us through the border, "Go! Go!" All the Thai cars and motorcyclists were just passing through the border without stopping. 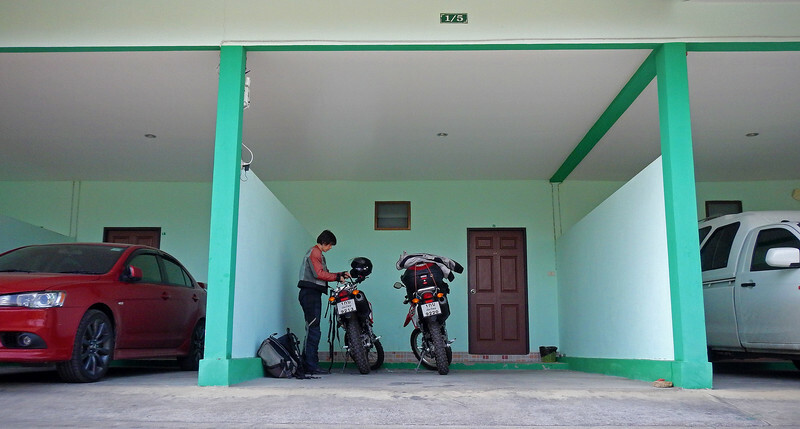 Call me a stickler, but I didn't want us to leave without getting the motorcycles properly documented out of Thailand. I've read up on the exit procedure for Thai vehicles leaving Thailand, and you require an official export form issued and stamped by customs. Add to the fact that we aren't Thai - I wanted to avoid any problems coming back to Thailand. We rode in and out of the No Man's Land looking for the customs building. After much pestering, one guard opened up a booth and processed our papers. Finally, we obtained official permission to leave the Kingdom with our motorcycles. 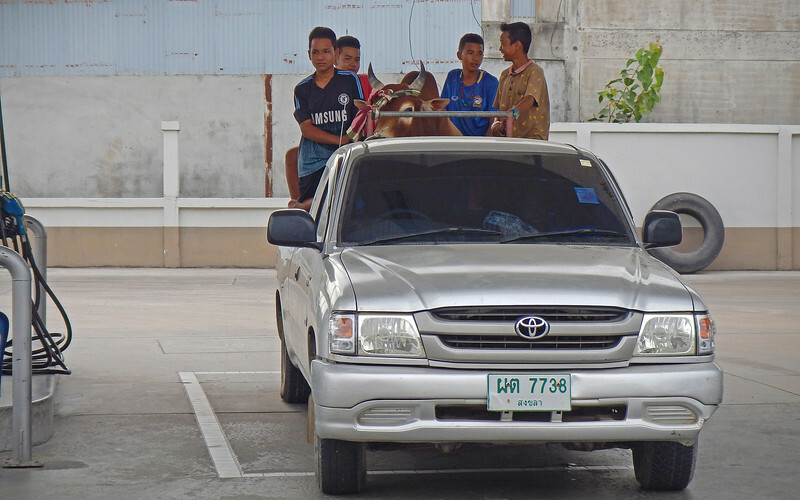 Thai vehicles are only allowed one month out of the country. Any longer than that and we would have to pay a fine to get back in. I know of no other country that does things this way. However, I was glad to have the permission form and official stamp on it. I've read a lot of accounts of travelers sneaking in and out of borders, not getting the proper documents and stamps. But to prevent future problems, we tend to do everything by the book, *especially* at borders. Selamat datang ke Malaysia! Welcome to Malaysia! 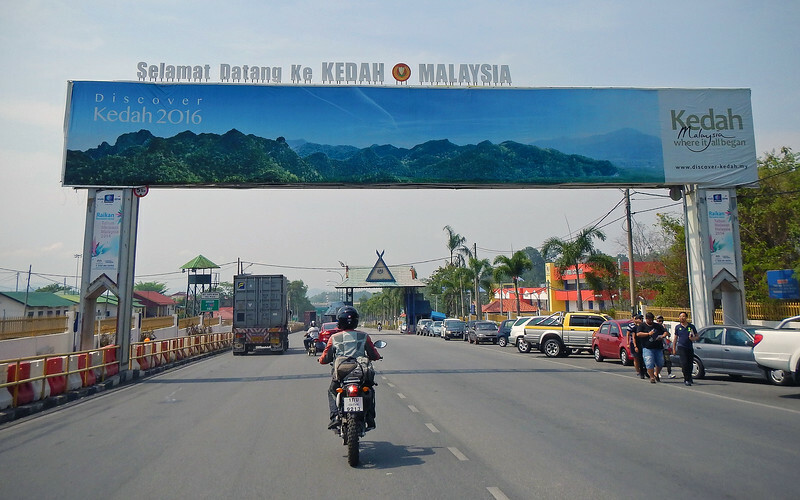 Kedah is the north-western-most province in Malaysia neighbouring Thailand and we were now preparing to enter it. 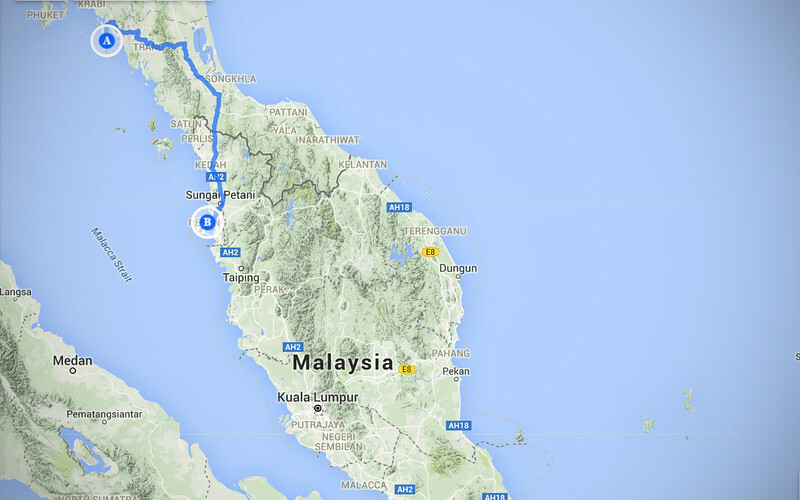 Now that we were officially out of Thailand, we have to get us and our bikes into Malaysia. 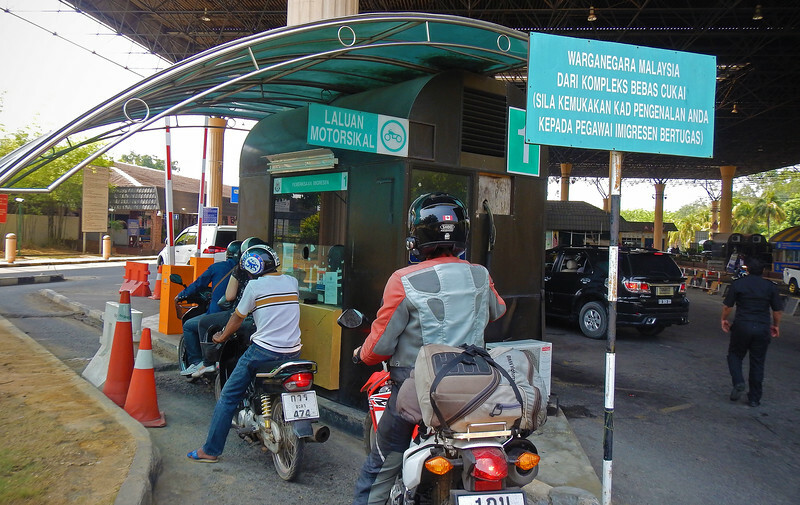 Motorcycles have their own lane for the border crossing. Cool! 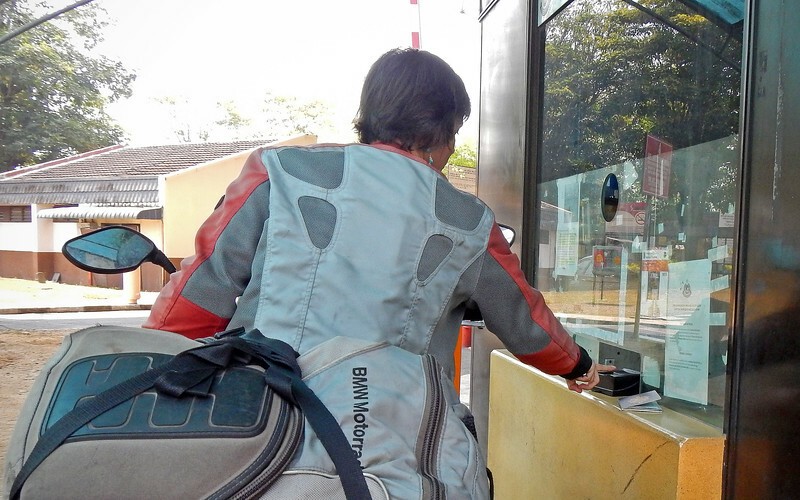 They fingerprint you at the Malaysian border. Not cool. 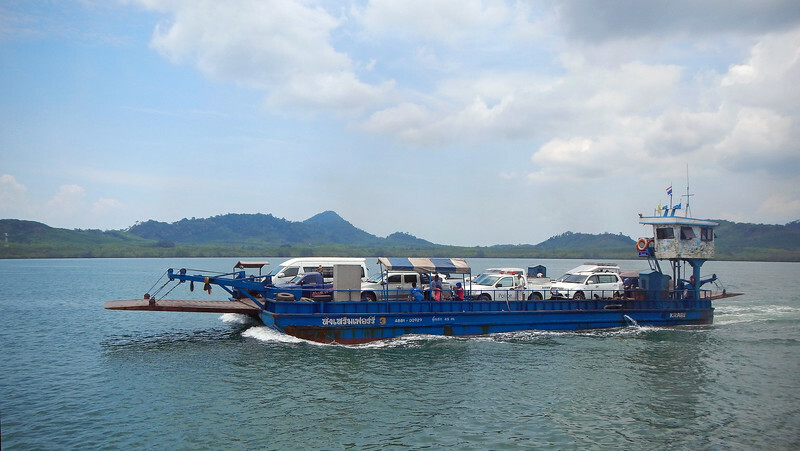 The border crossing for us was pretty quick, but it's always the vehicles that take longer. 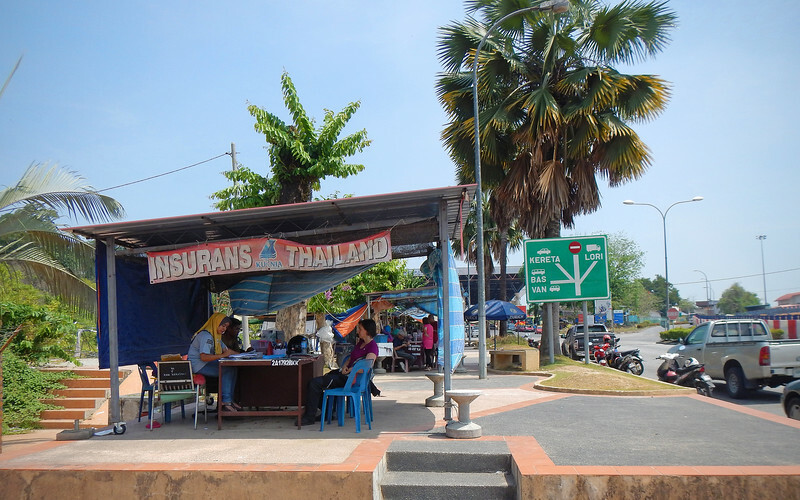 Our Thai insurance that we received when we bought the motorcycles didn't cover Malaysia, so we stop at this booth right at the border. And that's how you spell "lorry". And Taxi is spelled "teksi". Lots of English words are just transliterated into Malay. Three guesses what a "bas" is? The Insurans lady translates our rear license plate and makes stickers for us that conform to Malaysian rules. Hey, my first sticker on my CRF! Adds 5hp! 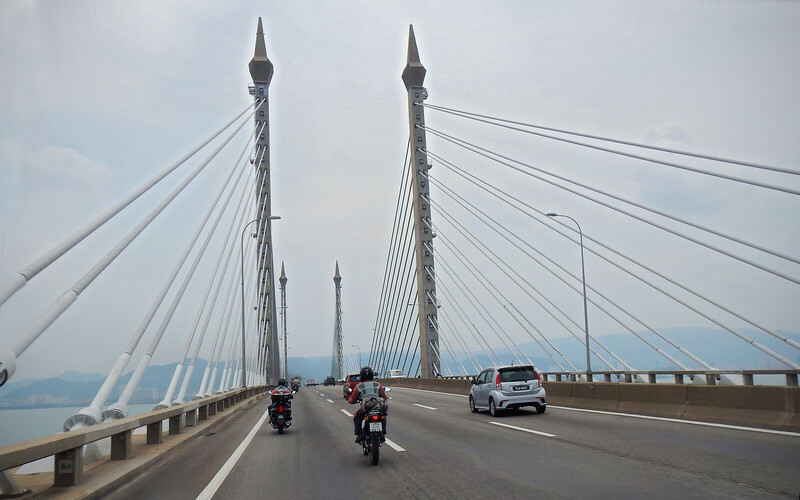 We go to the customs office and get our bikes imported into Malaysia. 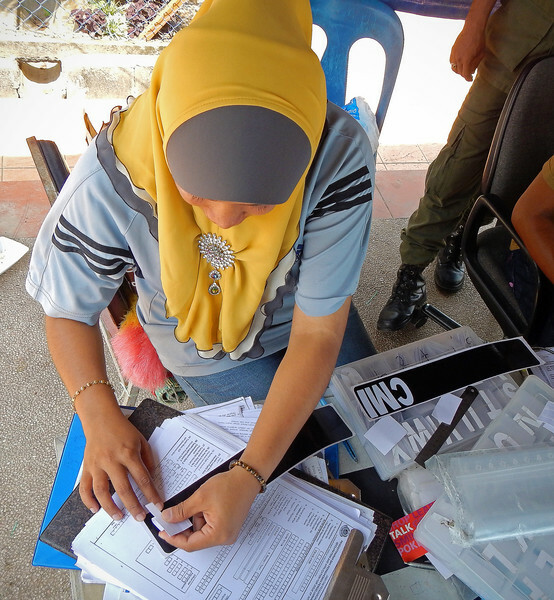 There are numerous forms to submit, and in the end we received an International Circulation Permit - which is strange because we've been riding all around the world and never needed one of those before - as well as the official temporary import papers into Malaysia. Whohooooo!!!! We are in Malaysia! It feels pretty cool to come back to the place I grew up.... on motorcycles! There's so much I want to show Neda, but part of me is feeling just a tiny bit of trepidation - that I won't do the place justice. 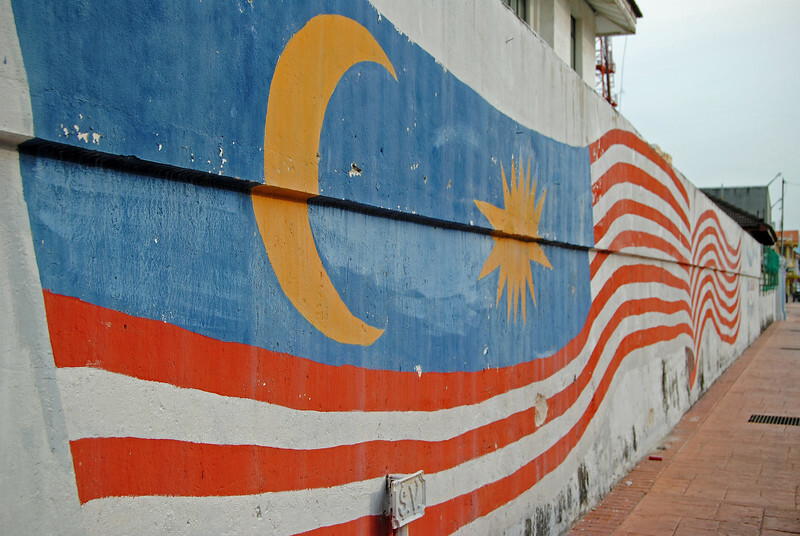 I left Malaysia shortly before my ninth birthday, so I only have childhood memories of this place. By contrast, Neda left Croatia when she was nineteen, so when she shows me around her home country, she is able to add so much more details and colour to her commentary. The road from the border is boring, same scenery as Thailand. Still, Neda comes in over the communicator: "It's so nice being able to read the road signs again!" I reply, "You can read Malaysian?" She responded, "No, I meant the letters aren't in script anymore". "Oh yeah, so it is". It seems like I am taking a lot of things for granted in Malaysia, not noticing the small things that Neda is. She asks me what certain words mean. I didn't really learn a lot of Malay before I left, but I teach her the basics - thank yous and greetings: "Selamat Pagi is good morning. The sign you read when we first came in, Selamat datang is welcome"
"Oh, so selamat is like from when we were in Morocco, the Arabic greeting Asallam Alaykum"
"Oh yeah, I never thought about that". Neda was pointing out things that were plain to see, but I just never put it together because of over-familiarity. I do the exact same things when she is teaching me Croatian. Interesting role-reversal. We stop by a food centre at one of the gas stations. 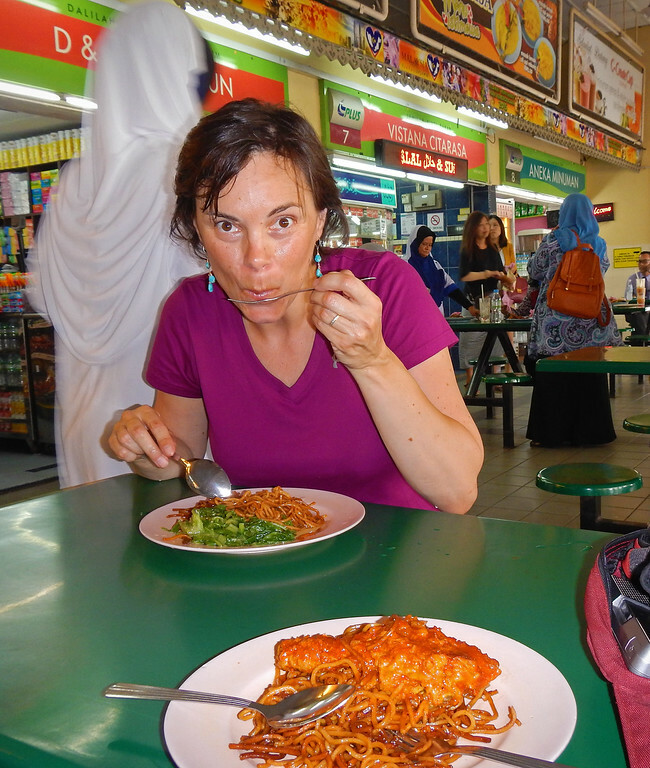 Our first Malaysian meal! I was afraid that I wouldn't remember anything about Malaysia, but staring at the menu in this food stall, mental images starting flooding back reading the items. Perhaps the brain may not be that good at recall, but the stomach certainly is. I ordered us some Mee Goreng, a noodle in a blend of oyster and soy sauce with lots of veggies and some chicken thrown in. It was delicious! And from a stall at a gas station too! I can't wait to try the food in the restaurants!! !